Good morning. I’m delighted to welcome the Asian Universities Alliance (AUA) and its third annual summit to Hong Kong. Thank you for inviting me to join today’s Presidents Forum, where great minds like yours come together to consider issues of concern to us, and issues of importance to Asia and the world. Hong Kong prides itself on connectivity, and we promote our city as Asia’s World City, a perfect location in Asia for people to connect and excel. The focus of such connectivity ranges from finance to trade, from technology to culture, etc. This is why throughout the year, the Hong Kong Special Administrative Region Government hosts or supports international and regional gatherings like the Asian Financial Forum, the Belt and Road Summit, the Internet Economy Summit (which by the way will take place tomorrow at the Hong Kong Convention and Exhibition Centre) and the Asia Cultural Co-operation Forum. I am therefore delighted that the AUA has chosen Hong Kong as the place to hold its third annual summit. Obviously the AUA also believes in the power of connectivity, which explains why since the Tsinghua University first proposed to establish the AUA in April 2016, it had only taken a year for all the preparatory work to be completed and for the AUA to be formally launched in 2017. Through the AUA, the 15 founding universities seek to jointly address regional and global challenges, specifically related to higher education and economic, scientific and technological development, by strengthening collaboration. In Professor Qiu’s words, the founding of AUA marks a significant milestone in Asian higher education. It is a product of the common needs and shared expectation of the 15 founding universities. This growing connectivity within Asia is, in my view, both necessary and meaningful. The region already plays a pivotal role in the global economy and is destined to continue to provide the impetus for growth. In my former capacity as the Chief Secretary for Administration, I was invited to contribute a piece to a publication by the UK’s Asia House released in 2016 entitled Asia 2025. In the book’s Foreword, the Chairman of Asia House remarked that “it is not the abundance of opportunity that will fully confirm Asia’s significance”, but we will be seeing “a new phase of global development and underlining the value of educational links and shared scientific research”. With its foresight, AUA and its founding universities are clearly embracing that shared value. At the government level, especially with the strong tradition of an open economy, Hong Kong embraces the importance of enhanced connectivity with other Asian economies. To name just a few of our specific initiatives, we have entered into a Hong Kong – ASEAN Free Trade Agreement and related Investment Agreement in late 2017, which subject to the necessary ratification should come into effect this year. We have opened a new Hong Kong Economic and Trade Office in Bangkok in February 2019, our third office in ASEAN after Singapore and Jakarta. We have plans for opening similar offices in Dubai, Mumbai and Seoul. Since taking office in July 2017, I and my colleague, the Secretary for Commerce and Economic Development have visited Singapore, Thailand, Indonesia, Vietnam, Myanmar, Cambodia and the Philippines. We have introduced Belt and Road scholarships for students from Thailand, Indonesia, Malaysia and Myanmar to study in our local universities. I should add that for over 20 years, the Hong Kong-based Asian Youth Orchestra has helped nurture music and friendship amongst young musicians in the region. The education links represented by the AUA are therefore a much-valued partner in this enhanced network that we are building. Let me now turn to the Presidents Forum today. Your forum agenda, with sustainable development and technological entrepreneurship as central themes, is as ambitious and welcome as the AUA itself. The central question at hand is this: what can our post-secondary institutions bring to these complex challenges, these compelling opportunities? The answers will go a long way towards realising a flourishing and inclusive future for our universities, our economies and the Asian region as a whole. Innovation and technology is a policy priority for my Government and an area of progressive growth and boundless promise for our universities. Hong Kong has what it takes to be successful in this field. To start with, we have world-class research capabilities. Four Hong Kong universities rank among the world’s top 100. That includes the Hong Kong University of Science and Technology, a founding member of the AUA. Let me add that this prestigious university is among the top young universities in the world, leading the way in science and engineering-related subjects. Hong Kong’s technology research strengths include biotechnology, artificial intelligence and robotics. To expand on these and other areas of excellence, we have in recent years put in place numerous policies and programmes to promote R&D at our universities. Our Innovation and Technology Fund, for example, supports both applied and forward-looking R&D projects undertaken by our universities. We also have the Technology Start-up Support Scheme for Universities under the Fund, which enables university professors and students to start technology companies and commercialise their R&D results. In January this year, we launched the Partnership Research Programme under the Fund. It sponsors R&D projects undertaken by private companies in collaboration with local universities. There is also a dedicated programme which funds universities engaged in midstream research. On top of the above, our Innovation and Technology Fund assists universities in their technology transfer. And, I’m pleased to note, R&D results among our universities are encouraging. A start-up linked with Hong Kong Polytechnic University, for example, developed soft contact lenses and spectacle lenses that can retard the progression of myopia in children. Its related defocus-incorporated-multiple-segments technology won the Grand Prize at last year’s International Exhibition of Inventions of Geneva. The research behind this breakthrough was funded by our Technology Start-up Support Scheme for Universities that I mentioned just now. By the way, I am thrilled to learn from yesterday’s news and this morning’s newspapers that this year’s Geneva Exhibition of Inventions’ Grand Prize also goes to a Hong Kong company, a start-up at Science Park, with a water-based manufacturing process to recycle and reuse lithium battery as its winning entry. Excellent work is also being done by the 16 State Key Labs and six local branches of Chinese National Engineering Research Centres here, which are funded in full or in part by the Innovation and Technology Fund. Hosted by Hong Kong universities, their achievements include the new stress-tolerant soybean cultivar, and the world’s first scientific model for predicting metal toxicity in marine environments and bodies of water. Let me add that Professor Dennis Lo, Director of the State Key Lab of Translational Oncology, was named among the “Top 20 Translational Researchers” for two consecutive years by the world-renowned journal Nature Biotechnology. Professor Lo developed a noninvasive prenatal diagnostic technology that has benefited millions of pregnant women around the world. And SenseTime, a home-grown technology company in the Hong Kong Science Park founded by Professor Tang Xiaoou has developed into the world’s most valuable AI start-up in just a little over three years. It’s all very encouraging, which is why we continue to expand our support – through facilitating policies and considerable investment at some US$12.5 billion in the past two years. This fiscal year, my Government doubled annual funding under our Technology Start-up Support Scheme for Universities. Each university now gets more than US$1 million a year. We’ve done the same for the technology transfer office of each university, which means a doubling of funding to more than US$1 million a year. As for our State Key Labs and the Hong Kong Branches of Chinese National Engineering Research Centres, their annual funding has also been doubled to US$1.3 million. And to boost our impressive talent base, my Government launched the Postdoctoral Hub last August under the Innovation and Technology Fund. It funds universities and other organisations in their recruitment of post-doctoral talent for R&D work. The Researcher Programme also supports them in the hiring of local graduates to assist in R&D projects. Since February, the maximum time period for these two programmes has been extended to three years. Response is overwhelming with the Researcher Programme having sponsored over 3 800 local graduates to join the innovation and technology industry and the Postdoctoral Hub Programme having sponsored 360 postdoctoral talents to pursue a career in R&D. We are, in short, committed to helping our universities realise their full R&D potential. Our more ambitious goal, however, is to help build an international innovation and technology hub here in Hong Kong. That includes the establishment of two world-class research clusters at our Science Park – one targeting healthcare technologies, the other artificial intelligence and robotics. In each case, we are inviting renowned universities, research institutions and companies from all over the world to look to Hong Kong for their future. The response has been encouraging, and from such prestigious universities as Harvard, Stanford and Johns Hopkins in the United States, Imperial College and University College London in the United Kingdom, the Fraunhofer Institute in Germany and the Institut Pasteur in France. From the Mainland of China, the Chinese Academy of Sciences and the Tsinghua University are amongst the active project proponents. In all, we’ve received nearly 50 proposals to date, and the first research institutions will be setting up their laboratories in two brand new buildings at the Science Park before the end of this year. We are also building unprecedented connections and opportunity through the Guangdong-Hong Kong-Macao Greater Bay Area. The city cluster comprises the two Special Administrative Regions of Hong Kong and Macao and nine major cities in Guangdong, and each of the 11 cities will contribute their respective strengths. The Outline Development Plan for the Greater Bay Area was promulgated by the Central Government in February this year, and the goal of creating an international innovation and technology hub for the Greater Bay Area occupies a very prominent part of the Plan. To that end, we are strengthening our collaboration with the Mainland on the innovation and technology front under the “One Country, Two Systems” principle. With the support of the Central Government, our local universities and research institutions are now eligible to apply for state funding on science and technology and the approved funds will be remitted to Hong Kong. Also in last year, we signed a co-operation arrangement with the Mainland’s Ministry of Science and Technology, which serves as an action guide and framework for us to enhance co-operation in scientific research, nurturing of talents, transfer of results, etc. We also entered into a memorandum of understanding with the Chinese Academy of Sciences, which will set up an affiliated institution here in Hong Kong to facilitate its research institutes to participate in the research clusters I mentioned earlier. And we’ve established a Bay Area academician alliance to promote co-operation among academicians from the Chinese Academy of Sciences and the Chinese Academy of Engineering. They will help advise on the Greater Bay Area’s technological development. We would like to see more world-renowned universities and research institutions joining us, both for the research clusters being set up in Hong Kong and for the Greater Bay Area development. That is why university visits are now almost a “must-see” on my official itinerary overseas. Last week, during my trip to Japan, I visited the University of Tokyo, a member of the AUA, and had a very fruitful meeting with President Gonokami. While we are all excited about science and technological innovation, we must not forget about sustainable development, or the broader humanity issues, without which there will be little social and ecological harmony. I am glad to note that sustainable development is also a main theme to be discussed at this Presidents Forum. Hong Kong definitely realises the importance of sustainable development. And the Government has rolled out various environmental blueprints and measures to tackle environmental degradation. I should add that there is also a dedicated chapter in the Guangdong-Hong Kong-Macao Greater Bay Area Outline Development Plan entitled “Taking Forward Ecological Conservation”. But time will not allow me to go into details this morning. 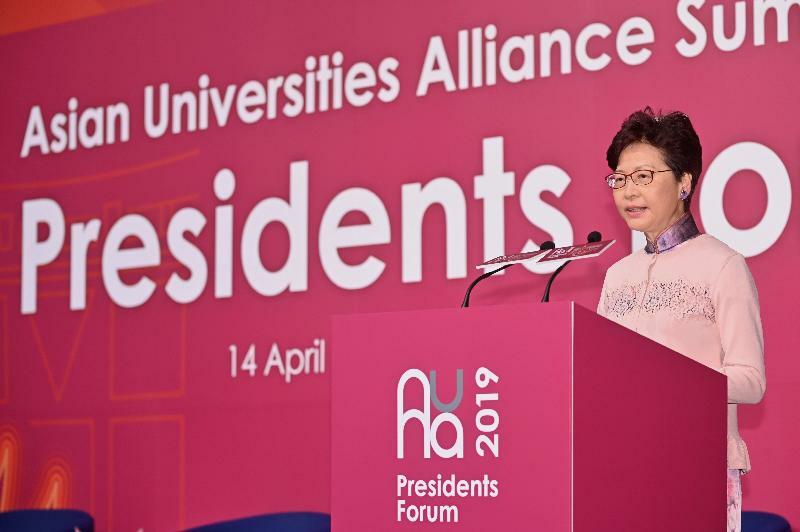 Finally, I wish the AUA, and each of its member universities, continuing success, and all of you a rewarding Presidents Forum and Summit here in Hong Kong. Thank you very much.